Ol’ man Eagle is back, floatin’ Apocalyptically on a Whaleheart down the Dream River. Eight gentle percolations fire the pressure-cooker of life, dialing us into the Callahanian mind- and soul-set. Deep like aqua, soulful like man and animal alike. 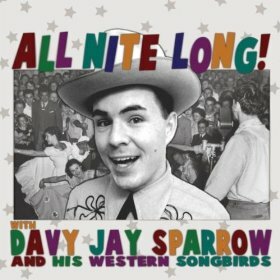 Davy Jay Sparrow’s – All Nite Long! Trigger on savingcountrymusic.com wrote:”Yes, yes, and yes! No ladies and gentlemen, Western Swing is not dead; not when Davy Jay Sparrow is on the job, doing his level best to keep the distinguished country music sub-genre fresh and fun by forging ahead with his fast-paced and frolicking take on one of country music’s original modes. When we spoke with Jonathan Rado from a Minneapolis hospital last month, he was having a pretty hard week. Physically speaking, Rado was in good health—he was at the hospital to visit his Foxygen bandmate Sam France, who had broken his leg onstage the previous night only a few minutes into the performance. The broken leg was one of a handful of crises on Rado’s plate that week, as headlines circulated about a tell-all Tumblr post from a former touring vocalist, a festival “meltdown,” and a subsequent string of canceled festival dates while France’s leg healed. While this particular week was probably one of Rado’s most stressful in recent memory, scrutiny from the music press is familiar to him and his band. When we do get around to the purpose of the call, his upcoming solo record Law and Order, Rado describes the album and its writing process as “stuff I would laugh at” and that he “doesn’t think much about it at all.” It’s easy to take those pull quotes out of context, but he’s actually describing a pretty organic songwriting and home recording practice, which takes place entirely—including a full drum set—in his current bedroom in New York and his childhood room in California. Black Joe Lewis, the Austin-based screaming-soul guitar player that won us over with help from his band The Honeybears on 2009’s Tell ’Em What Your Name Is, is back with his first album since 2011. Eight of the tracks on the album, entitled Electric Slave, were recorded at Austin’s own Church House Studios and produced by Stuart Sikes (The White Stripes, Modest Mouse, Cat Power), while the additional three songs were recorded at Elmwood Studios in Dallas and produced by John Congleton (Explosions in the Sky, St. Vincent).